Vembu Universal Explorer is Free Tool which is used for granular recovery of different application objects. You can use this tool for restoring Active Directory (AD), SQL, Sharepoint, Exchange Server objects. The free tool can restore individual items of Microsoft’s products from Image level backups (for physical servers) or from backups from virtual environments (vSphere, Hyper-V). There is a lot of recovery options, but there is a handy User Guide (PDF) which details the steps for different applications. For example, if you want to recover SQL Database, schema or tables, you can either export them as a file or send them directly back to the target SQL server. Today’s environments are fragile. Spyware, Malware, viruses, system corruption or hardware crash results that you need to have a possibility to granular restore of certain data. 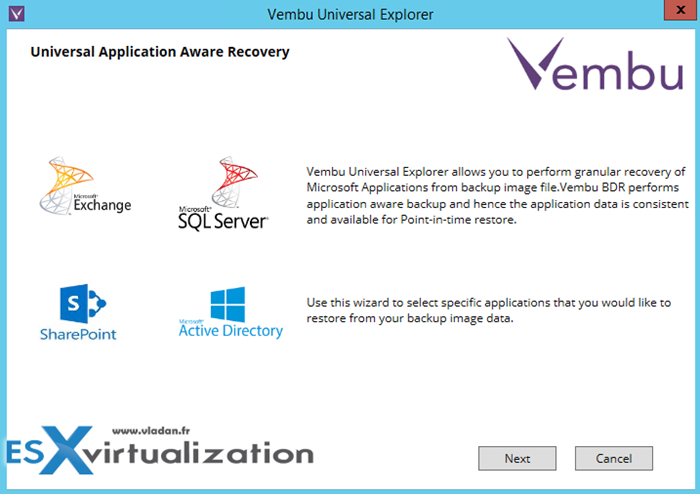 Vembu Universal Explorer tool has a lot of recovery options, but there is a handy User Guide (PDF) which you can download from the product page, and this guide details the steps for different applications. For example, if you want to recover SQL Database, schema or tables, you can either export them as a file or send them directly back to the target SQL server. Depending which option you chose, the assistant offers you a different recovery path. The application installs on Windows management machine (It does not need to be the Vembu Backup server). Then, via the network you can mount VHD from Vembu VM backup or from Vembu image level backup, to recover your data. mail-level restores by using .edb file (from VHD) and restores to live Microsoft Exchange Server. Exports Mails to .pst files. Possibility to Export MS SQL database object schema and object data of Tables, View, Stored Procedures in .sql file. Exports MS SQL database object schema and object data of Table, View, Stored Procedures in .xsl file. The installation process is fairly simple, but you’ll need to satisfy the requirements and perhaps install some software. In my lab, I quickly tested the installer and saw that SQL Express 2014 and Outlook needs to be installed, together with .NET framework. Those requirements are basically there in order to allow you to use the recovery features for particular Microsoft application. for example, you want to export mailbox items as Personal Folder Files (.pst) or restore to Exchange Server, it is necessary to have the 64-bit version of Microsoft Outlook 2010 installed in the system. The machine where you’ll want to install Vembu Universal explorere has to have those components (Note that you can just check the box which says “I will Install Prerequisities later”. So the workflow to recover an AD object from Vembu Backup would be as following. 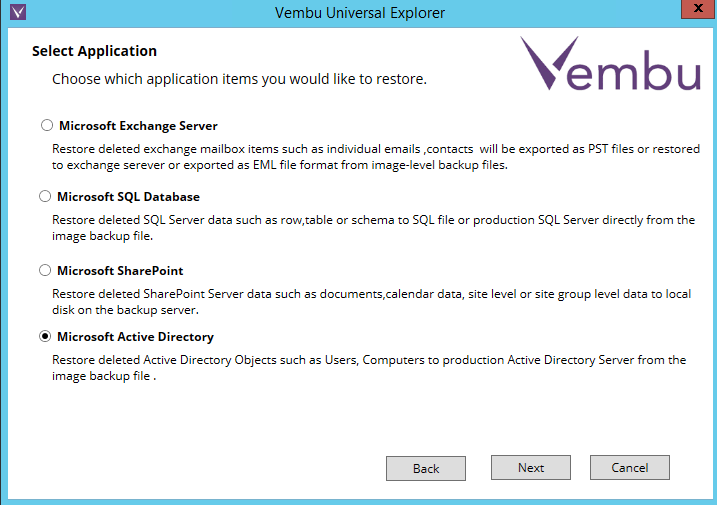 Vembu Universal Explorer is certainly useful utility for restoring individual items. Check it out. Note that Vembu has also another free tool which might be your interest. The tool’s name is Desktop Image backup (Free) which used for creating image level backup for your endpoints (laptops, desktops etc…). If your system gets corrupted by malware, crashes or gets stolen, you have the possibility to use Bare-metal Recovery (BMR) to recover the backed up Windows machines into same or different hardware. 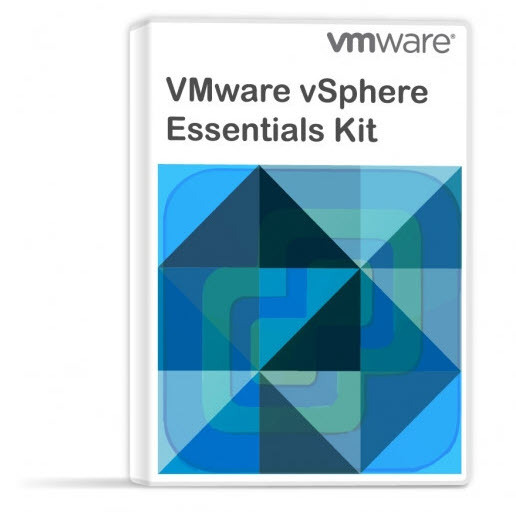 Vembu as a Backup and DR vendor offers other products (not free). Some of them I already talked about, like the VM Backup. Vembu ImageBackup – : Vembu ImageBackup is a complete backup and disaster recovery solution for Windows IT environments. It provides an option to do entire system level backup or specific file-level backup in Windows Servers and workstations. Vembu NetworkBackup – Vembu NetworkBackup is designed for small-medium businesses to protect business data across file servers, application servers, workstations, and other endpoints. With NetworkBackup businesses can backup all their systems to a central location which is easier to manage. Vembu SaaSBackup – Vembu SaaSBackup is designed to provide Backup & Recovery options for SaaS applications like Office365 & Google apps at affordable pricing. Vembu SaaSBackup allows you to backup and recover Mails, Drives, Calendar and Contacts of Office 365 and Google Apps at anytime and anywhere.